Like Chick-fil-A? Want free Chick-fil-A? Just go to Chick-fil-A between 10:30 a.m. and 6 p.m. on New Year’s Day (January 1…duh), buy something and you’ll be offered a free chicken biscuit on your next visit. There are Chick-fil-A restaurants in Redlands, Ontario, Rancho Cucamonga, Chino Hills, Upland, Corona, Riverside, Murrieta and Temecula. Not a bad a bargain, either, unless you happen to be a vegetarian…huh, Eric? So, I’ve been wanting to try Broguiere’s egg nog for a couple of years now, after reading people rave about it online and seeing it Huell Howser’s California Gold show. Was it good egg nog? Definitely. Did it live up to the hype? Not really. I was expecting something that would knock my socks off. What I ended up with was egg nog that took me back in time to the egg nog they used to sell when I was a little kid. Yeah, I know it’s an old joke, but I just had to do it. But there is some validity to it…Allan Borgen’s review this week is for the Mexican restaurant Picante, which is located inside a Shell gas station at Base Line and Cherry Avenue in Fontana. The Mega Breakfast Burrito sounds delicious. I may have to stop by next time I visit my friend, who lives (way) down the street. Click here to read Allan’s review. Also, Elaine “Lunch with ‘Lainey” Lehman visits San Biagio’s Pizza in Upland. I’d gone to San Biagio’s a while back. After reading Diana Sholley rave about it in her column, I had to try it. It’s authentic and really good…maybe not as good as my Italian grandmother’s pizza, but really good. I think it’s time to pay them another visit. Click here to read Elaine’s review. So it’s Christmas Eve and I’ve got a few minutes squeezed in-between holiday preparations to play catch-up from the week’s Inland Empire food news. First of all, we’ve got a pair of food reviews, as usual, from the Bulletin and the Sun. 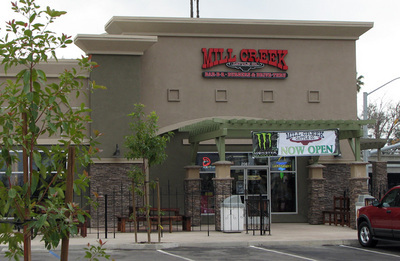 David Cohen traveled to Temecula to dine at Creekside Grille, located at Wilson Creek Winery. Elaine Lehman traveled to Yucaipa to have lunch at the Beach Cafe. I don’t get down to Temecula very often, but next time I’m in Yucaipa, I may seek out the Beach Cafe. It sounds right up my alley. Read David’s review here. Read Elaine’s review here. Next up, from David Allen’s blog, we read that Connal’s has replaced the old Mi Taco at 1226 W. 7th St. in Upland. The Connal’s chain, which was established in Pasadena 50 years ago, has doubled in size with the new location. That’s right…after 50 years, they now have two locations to serve you! David also notes that Connal’s is very generous with its portions. In his column, David recounts a little bit of the history of Connal’s, and hinted at the possiblility of adding Mi Taco’s signature Matador Salad (of which David has the recipe) to their menu. If you are a fan of Mi Taco’s Matador Salad, David might even share that recipe with you if you ask politely. You can email him here. You would think that with the economy in the state it’s in now, nobody in their right mind would be opening new businesses. Well, apparently restaurant owners are not in their right mind. “Reader Bob” emailed us here at Dine 909 to tell us that Mentone’s Mill Creek Cattle Co. has expanded. Indeed they have. The sit-down restaurant now has a fast-food-type location, complete with drive-thru, at 2087 Orange Tree Lane in Redlands, just across California Street from the defunct Pharaoh’s Lost Kingdom. So if you’re in the area (shopping at Wal-Mart, no doubt!) and are craving BBQ or burgers, be sure to check it out and let us all know how it was. Thanks for the tip, Reader Bob! Also, driving down Sierra Lakes Parkway in Fontana, I noticed that the Mimi’s Cafe at the corner of Sierra Avenue is soon to be open, and I also spotted the Dickey’s BBQ that is now hiring, so they should be open soon as well. Mimi’s is at 16933 Sierra Lakes Parkway. Dickey’s BBQ is just down the block closer to Citrus Avenue at 16391 Sierra Lakes Parkway. Of course, the most surprising thing about this entry is not that there are three new restaurants in the Inland Empire. It’s that Dine 909 has a reader! OK, so sometimes we’re not in the swift program here at Dine 909. But, better late than never, I always say! Friday’s Sun and Daily Bulletin brought us reviews of Riverside’s Dona Timo’s Cascada and Cafe Calato in Rancho Cucamonga. While I haven’t been to either of those eateries, I have been to the Dona Timo’s on Sierra Avenue Fontana and from what I remember, it was quite good. At one time, there was a Dona Timo’s on Highland Avenue in San Bernardino, but I think it has since closed. To read Allen Borgen’s review of Dona Timo’s Cascada, click here. To read Elaine Lehman’s review of Cafe Calato, click here. This made me laugh…I don’t know if you have to be a journalist to get the humor. From Rancho Cucamonga Now comes word that, along with the previously mentioned Pei Wei, the $5 million Rancho location of Mission Inn owner Duane Roberts’ Las Campanas has closed. Also shuttered are Noble House and the Rancho locations of The Whole Enchilada and Macaroni Grill. I’m a little surprised…but not. Las Campanas apparently opened to great fanfare in the summer of 2007, but must not have been able to sustain that success. Is it the fact that it’s not located at Victoria Gardens? I don’t think it’s a coincidence that none of the closing eateries are located there. And yet, there’s usually a wait at P.F. Chang’s, California Pizza Kitchen, Lucille’s, Cheesecake Factory and other Victoria Gardens restaurants. Heck, there’s even a line every time I go to Pinkberry! As the real estate clich goes: Location, location, location! I never made it to Noble House, but online reviews were above average for that Chinese restaurant. I’ve eaten at both The Whole Enchilada and Macaroni Grill, and enjoyed the food at both. The Whole Enchilada must’ve closed recently — their Web site still lists the Rancho location. From what I hear, the Macaroni Grill closing has been rumored for a while. I remember when they first opened. It was the only one in the area. Now we have one in Redlands, Montclair, Corona and Temecula. On the positive side, Wendy notes that Dickey’s BBQ has indeed opened and a vegan Thai restaurant, Bright Star, at 9819 Foothill Blvd. has opened as well. Click here to read her entry. What’s going on in your neck of the IE? Any restaurants closing? New ones opening? Feel free to comment below or drop us a line and let us know. The restaurant formerly known as Rockin’ Baja Lobster is bringing its south-of-the-border style seafood to the Montclair Plaza mid-December. Now known as Rockin’ Baja Coastal Cantina, the Mexican restaurant is scheduled to open December 13 in the former Tony Roma’s location at 9335 Monte Vista Avenue. With restaurants in California, Nevada, Texas and Mississippi, this will be the chain’s first in the IE. The only Rockin’ Baja I’ve been to is the Redondo Beach location, while I was on assignment at the Daily Breeze. From what I remember, it wasn’t that memorable. I seem to recall it was a little pricey, and the food wasn’t over-the-top spectacular, but the Caesar salad/salsa bar was a treat (although it appears they’ve done away with the Caesar salad portion of that). That said, that particular location has since closed. If you are thinking about checking out the Montclair location, you might want to click here first. Just consider that a little early Christmas gift from your friends here at Dine 909. One thing though…I never quite understood the concept of restaurants having a mascot that is ostensibly the main course. A little too Cluckin’ Chicken for me, I guess. Ga-ga-ga-goinggg!